Mysterious metal towers spotted all over New York City tunnels and bridges… surveillance devices? 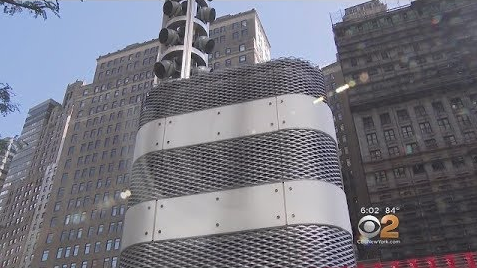 Residents of New York City have been both confused and awestruck lately at the sight of large, mysterious metal towers that are popping up all over the city. According to CBS2’s Dave Carlin, even those on the MTA board in charge of the towers are unable to explain why the towers are being erected or what’s inside of them. All that we know thus far is that the towers are part of a project that will cost roughly $100 million, and 18 of them will be set up near tunnels and bridges. Even though half of the money set aside for the mysterious project has already been spent and some of the towers are already up, some MTA board members, such as New York City Transportation Commissioner Polly Trotternberg, say that they don’t have much information about the towers at all. “A lot of the board members felt they didn’t have all the details they would have wanted, myself included,” she explained. Residents of New York City are just as clueless. “I’m going to guess that it’s not just decoration,” said Alyssa Renkas of the Upper West Side. Even MTA Chairman Joe Lhota refused to disclose any significant information. When CBS2’s Dave Carlin informed Lhota that some of his own board members didn’t know the specifics of the project and pressed him for details, Lhota replied, “I’m not at liberty to discuss that.” He went on to say, “The base of these new pieces that are going up include whatever fiber optics are necessary for those Homeland Security items.” In other words, the towers could be some kind of anti-terror technology, but that still has yet to be confirmed. If the towers really were meant to prevent acts of terrorism, it certainly wouldn’t be the first time that New York City has taken such precautionary measures. Earlier this year, the city launched a set of initiatives designed to collect information regarding where you’ve been, where you’re going, and who you’re with. An NYC Taxi & Limousine Commission proposal, for instance, attempted to force Uber, Lyft and black car drivers to report passenger drop-off locations. In addition, the official website for New York State stated that “At each crossing, and at structurally sensitive points on bridges and tunnels, advanced cameras and sensors will be installed to read license plates and test emerging facial recognition software and equipment.” Could this be what the mysterious towers are? Are officials now in the process of putting up advanced cameras and sensors that will have the ability to identify faces and read license plates? It certainly seems that way, but we still don’t know for sure. Of course, whenever anti-terror technology is being considered, the question that needs to be asked is as follows: “Does the technology and the surveillance methods being used comply with the Fourth Amendment of the Constitution?” Indeed, the usurpation of privacy rights is something that is becoming a very real problem in America today as technology continues to advance, and if we are not careful, we will lose the Fourth Amendment altogether. If the towers being put up in New York City are meant to keep the people safe, then that is something that should be commended, so long as the MTA is in full compliance with the Constitution.